Luxury hotel barge company, European Waterways, is preparing for a great European summer by offering discounts on cabins on most itineraries booked by May 30, 2017. For those contemplating an escape from the Southern Hemisphere winter, European Waterways has ensured that guests have a range of itineraries and departure dates during the busy summer months to choose from. 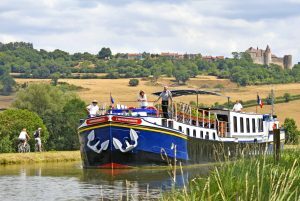 Hotel barge, L’Impressionniste, cruises the Southern Burgundy canals and has 10% off cabins on July 9 & 23 departures. The journey introduces a wonderful blend of Burgundian countryside, history and viticulture. Home to historic and world-renowned vineyards, guests will have the opportunity to visit ‘vigne de l’enfant Jesus’, a famous vineyard owned by the Domaine Bouchard Père et Fils. Their wine expert gives real insight into the domaine’s production of its Grand Cru and Premier Cru wines. There is also a visit to Château de Bussy-Rabutin to see the portrait gallery created by the disgraced courtier of King Louis XIV, before strolling through the gardens and enjoying views of the château surrounded by its moat. On popular hotel barge, Anjodi, guests will meander the 330-year old Canal du Midi. The colourful market of Narbonne, a Roman Mediterranean capital, shows off this bustling town where guests can soak up the vibrant atmosphere where Visigoth monarchs once lived. History lovers will enjoy a tour of Carcassonne – the most complete medieval fortified city in existence – and food lovers will enjoy feasting at L’Ambassade, a Michelin-rated gastronomic restaurant in Beziers. Cabins for July 2, 9, 23 and 30 departures are offered 10% off. If the Italian sun is calling, La Bella Vita’s cruise in Venice & the River Po is available 10% off cabins on the July 9 departure. Immerse yourself in Italian Renaissance culture as you cruise the Venetian lagoon and the calm waters of the Po Valley en route to the elegant city of Mantua. Venturing on land and water, this itinerary covers all things that encompass Italy – exceptional food, rich history and breath-taking scenery. Discover the lesser known Castello District or cycle along the 18th century Istrian sea wall. The hotel barge joins the Bianco Canal and cruises to Adria, an ancient Etruscan town, to visit their Archaelogical Museum before driving to the Bagnoli Estate to enjoy a private tasting of their renowned estate-grown vintages. Every hotel barge carries its guests in luxury, pampered by a crew of four; a master chef, a hostess, an English-speaking tour guide and a professional, highly personable captain. For all European Waterways’ 6-night cruises, gourmet meals, drinks, transportation and tours of local attractions are all inclusive.